In modern British and American popular culture, Halloween is the night most associated with the nocturnal activities of witches and the souls of the dead. But in much of Europe the 30 April or May Eve, otherwise known as Walpurgis Night, was another moment when spirits and witches were thought to roam abroad. The life and death of Saint Walpurga, who was born in Dorset, England, in the eight century, has nothing to do with witchcraft or magic, though. She travelled to Germany on missionary work, and became abbess of a nunnery at Heidenheim, dying there in the late 770s. The 1 May became her feast day because it was when her relics were transferred to Eichstätt in the 870s. The association of witchcraft with May Eve is actually to do with venerable rituals for protecting livestock at a time in the agricultural calendar when animals were traditionally moved to summer pastures. Bonfires were lit by communities across Europe to scare aware predators. In sixteenth-century Ireland, hares were killed on May Day, in the belief that they were shape-shifting witches bent on sucking cows dry and stealing butter. In Scotland, pieces of Rowan tree were placed above the doors of cow byres to keep witches away. In German folklore, though, Walpurgis Night is particularly associated with the tradition that witches gathered from across the land for a great sabbat on the top of the Blocksberg (now Brocken), a summit in the Harz Mountains of central Germany. This great witches’ meeting may have been much depicted in nineteenth- and twentieth-century art and literature, but look closely at the early-modern witch trial records, and one finds little evidence for it. From the hundreds of confessions, most produced under torture, it is clear that sabbats were thought to take place at any time of the year and not Walpurgis Night in particular. From the records we also find that nocturnal sabbats were believed as likely to take place in clearings and meadows as on mountain tops. Praetorius Blocksberg Verrichtung. Witches’ Sabbath by Johannes Praetorius. Public domain via Wikimedia Commons. The stubble is yellow, the new grain is green. And You-Know-Who will take the chair. Widely lauded and translated, Goethe’s Faust, provided inspiration for subsequent artists, including the likes of the writers Bram Stoker and Thomas Mann, and composers such as Brahms and Mendelssohn. 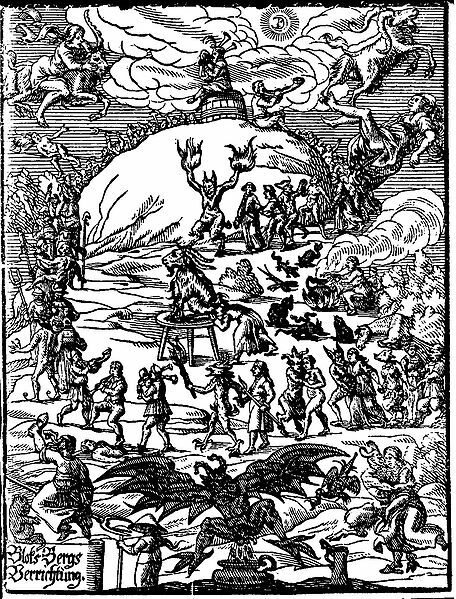 The Walpurgis Night sabbat on the Brocken continues to be referenced in popular culture today by the likes of heavy metal bands and in horror films, while the tradition has also been adopted into the Neo-pagan calendar as an analogue of the supposed Celtic festival of Beltane. So watch out this Bank Holiday weekend, for there might be witches abroad. Featured image credit: Lewis Morrison as “Mephistopheles” in Faust! – “The Brocken”. Theatrical performance poster for Faust, 1887. Public domain via Wikimedia Commons. Owen Davies is Professor of Social History at the University of Hertfordshire. He has written extensively on the history of magic, witchcraft, ghosts, and popular medicine, including The Haunted: A Social History of Ghosts (2007), Grimoires: A History of Magic Books (2009), Paganism: A Very Short Introduction (2011), Magic: A Very Short Introduction (2012), and America Bewitched: The Story of Witchcraft after Salem (2013). 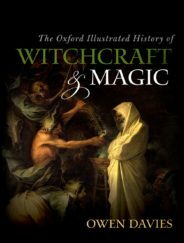 Most recently, he is the editor of The Oxford Illustrated History of Witchcraft and Magic. Wow! Always wonder how was life back then! Creepy!